SpaceX successfully tested an escape system on board its manned spaceship prototype. Likened to ejector seats in fighter jets, it is intended to provide escape capability from the launch pad all the way to orbit. A prototype Crew Dragon vehicle blasted off from Cape Canaveral Wednesday morning with a test dummy on board. The crew capsule successfully separated from the body of the ship and splashed safely into the sea using parachutes. “Had humans been on board today, they would have been in great shape,” the company said in a report about the test. 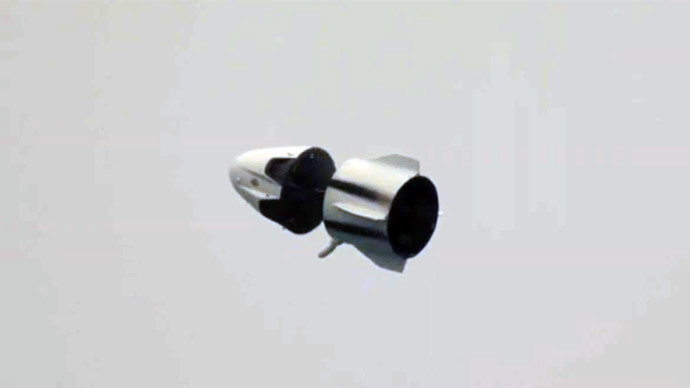 Described as “revolutionary,” SpaceX’s escape system is designed to use the eight SuperDraco engines already built into the hull, with the primary purpose of helping the spacecraft make a powered landing at the end of its mission. Each engine produces about 15,000 pounds of thrust. The technology is officially designated the Launch Abort System (LAS). It is similar to an ejection seat for a fighter pilot, but instead of ejecting the pilot, the entire spacecraft is “ejected” away from the launch vehicle, the company explained. Current manned spaceships have limited-capability LAS mounted on top, which can only work during a brief window immediately after launch. The technology saved the lives of two Soviet cosmonauts in 1983. Fourteen astronauts perished in shuttle disasters, in 1986 during the launch of the Challenger, and in 2003 during the re-entry of the Columbia. The next test, scheduled for June, will take place at the Vandenberg Air Force Base in California, and involve an actual booster rocket. SpaceX is aiming to conduct the first manned flights of the Crew Dragon by 2017, and wants to ensure the safety of the crew. Currently, the company’s unmanned version of the Dragon spaceship serves as the primary US-launched supply vessel for the International Space Station, but all crewed launches to the ISS have to rely on the Russian Soyuz spacecraft, originally designed in the 1960s for the Soviet lunar program. Russian space agency Roscosmos is developing a successor to the Soyuz, dubbed the 'Prospective Piloted Transport System' (PPTS).